Anna Sophia Horn was born in the village of Reinwald, located not far from the Volga River in Russia, on July 19, 1869. It was in this village that she married my great-grandfather, David Markgraf, who was the first in his line to be named David. David and Sophia shared their life together until David died. During the few years they had together they had three children, David born 16 Jun 1886, Maria Catharina born 1888, and Alexander born 28 Apr 1890. On 25 Jun 1890 Sophia married Heinrich Langmann and they continued to live in Reinwald until 1908 when they immigrated to Sheboygan, Wisconsin. They only brought Maria, 14 years old at the time, with them, for their son David married Anna Maria Schardt and would remain in Reinwald while his mother and stepfather established a home in Sheboygan. Alexander died at an early age. Upon their arrival in Sheboygan the couple found residence at 915 Eire Avenue in an area the was populated by Germans from the Volga colonies. On 17 Dec 1909 Sophia met with the Medical Examiners to apply for a license to become a mid-wife. I was fortunate enough to find this application along with a required photograph that is shown below. Heinrich worked in a foundry in Sheboygan. Probably the Kohler Company who manufactures bathroom fixtures for many immigrants were employed by this company. Their daughter, Maria, worked at one of the many furniture factories in Sheboygan. 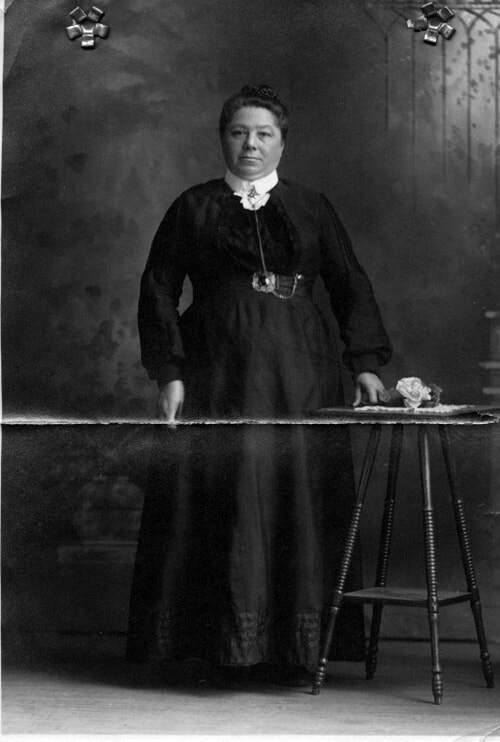 Photograph of Anna Sophia from her application for a mid-wife license in 1909. Courtesy of David Markgraf. ​Sometime prior to 1916 Heinrich and Sophia moved to Portland, Oregon and became members of the Second German Congregational Church located on East 8th and Skidmore. They lived in the St. John's neighborhood of Portland. On 11 Mar 1916 Sophia died at the age of forty-six and was buried at the Rose City Cemetery. It amazes me to see what she did in those forty-six short years. What brave people were the Germans from Russia. On 29 Apr 1916 Heinrich remarried to a lady named Lena. I do not know her maiden name but hope to discover in the future. Heinrich died on 05 Mar 1938 and Lena died on 18 Feb 1943 they too were buried in the Rose City Cemetery. I am still looking for what happened to the daughter Maria and whether Heinrich had any children with either Sophia or Lena. This mystery continues. David Markgraf II did immigrate in 1911 with his wife Sophia, their daughter Maria Sophia, their sons, David III, Karl Thomas, and Johann Henry. David III married my mother, Vernetta Lau and had me as their son, David IV. I have continued the tradition by having a son David V, a grandson David VI and now a great-grandson Aidan David. Any information you might have on the Markgraf family would be greatly appreciated.